Kathy Lynn Taylor Scifres MacDonald, age 65 of Seymour, passed away on Thursday, January 31, 2019 at home with her family surrounding her bedside. Born January 14, 1954 in Jeffersonville, she was the daughter of Sam Taylor and Joeann (Gibson) Croinex. On November 25, 2007 in Seymour, she married David “Mac” MacDonald. Kathy went to Scottsburg High School before graduating from Ball State University with an Associate Degree. She owned and operated L & K Painting and Wallpapering for several years. Kathy then worked as a brick mason for Marr Company where she earned the nickname of “Hotdog”. She then retired from Master‘s Transmission where she worked as a union machinist. She was a member of the New Life Assembly. Kathy also was a member of the American Legion Auxiliary Post #89 and a former member of the the Moose Lodge. 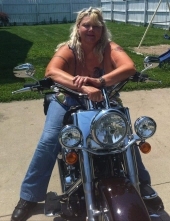 Her biggest love was riding her Harley Davidson Road King. Kathy enjoyed listening to music, especially Janis Joplin. She enjoyed tinkering and building things with power tools. Survivors include her husband, Mac; mother, Joeann Croinex of Seymour; siblings, Brenda Creech, Linda (Jeff) Rumph, Susie (Kent) Wagner, Jill Pike, David (Toby) Taylor, Chris (Patty) Taylor, Robert (Cheryl) Taylor, Harry Thomas, and Robert Thomas. Kathy also leaves behind numerous nieces and nephews whom she loved dearly and enjoyed spending time with them. She also leaves her precious dog Shelby. Kathy was preceded in death by her father, Sam Taylor and first husband Richard Lee Scifres. Pastor Steve Hyer will conduct a celebration of Kathy’s life at 3:00pm on Saturday, February 9, 2019 at Woodlawn Life Celebration Centre. Friends can visit from 1:00pm to 3:00pm. Burial will follow at a future date at Crothersville Cemetery. Memorials can be written at the funeral home to the Salem Animal Control. Friends can sign the guestbook or share a favorite memory at www.woodlawnfamilyfuneral.com. To send flowers or a remembrance gift to the family of Kathy Lynn MacDonald, please visit our Tribute Store. "Email Address" would like to share the life celebration of Kathy Lynn MacDonald. Click on the "link" to go to share a favorite memory or leave a condolence message for the family.